Yes,that's what I am doing now. The project is quite simple - a few daisies scattered here and there. The idea of trying out the new thread came while I was transferring the design. Thanks to a dear friend I was in possession of DMC's metallic range called Light Effects. Click on the pics to see the actual shine of the threads . DMC has come up with several variations under this metallic range - Jewel, Antique,Pearl and so on and so forth. Don't these threads look as if a lot of tubular beads have been strung together? Let me admit - I am no fan of metallic threads. We get Anchor stranded metallics here and everytime I've tried to use them, I've had a hard time. 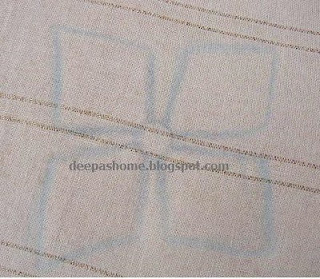 It required all my patience to try this Dori embroidery with Anchor metallic. So it was with a bit of hesitation that I embarked on this experiment.Here's my trial. The right purple is anchor stranded cotton and the left one is DMC Light Effect. I've left the picture big enough for you to see the difference,so do click on it. The dark green is Anchor Metallic and the teeny bluish green is DMC. That's the anchor metallic shown below. Does anyone know if Anchor too has a similar range? Since I had issues with metallic threads before, I changed my strategy a little bit and used only short lengths for stitching. Usually for cotton threads, I use elbow length (from my palm to the elbow). In this case, I threaded only half of that - which means pretty short . But it worked well.I wouldn't mind using them again in my future projects. Have you tried metallic threads? Did you enjoy working with them? Long back I had seen a peacock worked entirely in metallic and that had inspired me to get the Anchor ones- but me and the threads never got along and the idea was discarded. Anyways, I need to finish a few more bunches like these and this little piece will be done. The pattern calls for detached chain aka lazy daisy stitches throughout. But I've a slightly different plan. If it works out, I'll show it off in the next post. Like you said, short lenght of mettalics with a strand of cotton works for me ...otherwise...it's really a pain. Have a great week and it is good to hear from you! I love the red and white against the embroidered white! So crisp. Lovely work, as always. I've used metallic threads but have to admit I'm not a huge fan of the process. Love the end results though! I generally use short lengths and run the threads through 'Thread Heaven' first. I must get some of the Light Effects to try because they are beautiful! Hi, Deepa,I made a small cross stitch design of a shoe entirely with metallic thread and I found it hard on my fingers.I will use it again but mixe with other tread. I like your daisies a lot and it certainly will look nice when it is all done. Hi, Deepa. It is certainly difficult to work with metallic thread.I done a cross stitch of a shoe enterily done with metallic thread and my fingers were really sore.i will use it again mixe with other floss. I like your daisies a lot and will look great when it is done. I like youe disies very much. Can we get mettalic thread in India like one this? Hi Deepa, wonderful as always and very nice of you to share your "experiment" yet again... I have used metallic threads and I also do not care for them, so I use short lengths and use it very sparingly... I find it stiff, almost wiry, and therefore I don't like the feel. Hugs. Deepa pink looks better in place of yello..just a thought.. I am excited to see you in my blog Deepa. Thanks for entering. I Love doing embroidary. I really missed your crowel embroidary course at Chennai, then i was here at Kansas to look after my pregent dil. I am waiting for another chance. Can you kindly advice me that what are the materials i should get from here at USA, because i am having less knowlege in embroidary and here it is like an occean available embroidary things at Hobby Loobby and michals. Can you pl. advice me that what shall i get from here that will useful for doing embroidary. Your daisies are so pretty, I hope that you will show the finished result. You give me a wish to try embroidery!